This newsletter is entering its third year, thanks to your participation! I rarely know what each month’s going to bring. It works because you are willing to share your experiences of loving our Earth. I find that the extraordinary often lies in the most ordinary. You can see all past issues at this link. This month, a sculptor, Almuth Tebbenhoff, shares her experience and perceptions of water through a piece she created that is currently on exhibit outside The Salisbury Museum, England. I’ve included a brief description and history of the location as it gives the context for her piece, and beautifully amplifies the meanings of both the water and the stone of which it is made. Anello Flow is inspired by the location and deep history of the Salisbury area. Water has shaped the chalk landscape of Wessex and informed the position of the modern city. Nearly 800 years ago Salisbury Cathedral moved from its hilltop location at Old Sarum to the valley below to dominate the confluence of five rivers – the Avon, Nadder, Wylye, Bourne and Ebble. The Cathedral’s shallow foundations sit on a bed of river gravel saturated with water; it is often claimed the cathedral ‘floats’ and that’s why it still stands. It seems appropriate that Anello Flow sits alongside this floating stone edifice. The sculpture also reaches into the museum’s collections. Prehistoric axeheads found in Wiltshire were made from stone found in Cornwall, north Wales, the Lake District and even jade from the north Italian Alps. The axes were parts of ‘distant places’—it is even possible the more distant and difficult the stone source was to reach, the more valued the item became. This could be represented on a grand scale with the bluestones at Stonehenge, having been quarried and transported from west Wales over 4,500 years ago. 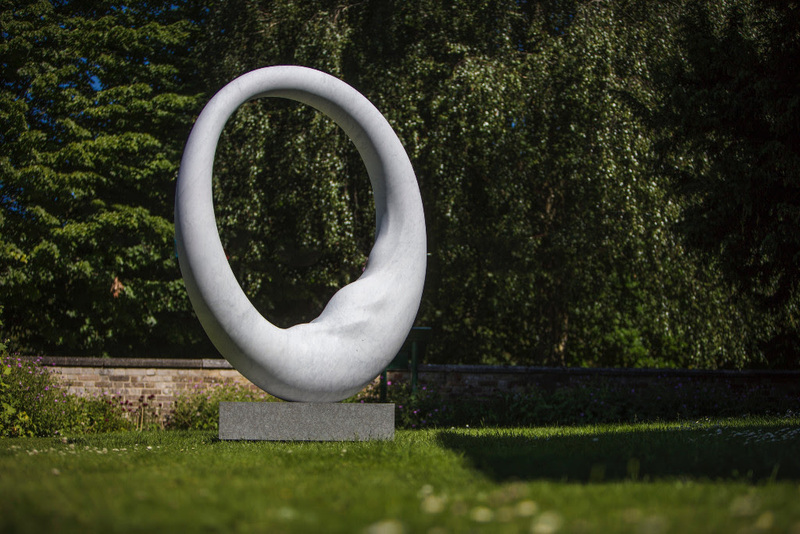 Anello Flow is part of this continuum, stone from a distant place shaped by Almuth into a graceful form that is inspired by the very substance that underpins the history of the Wessex landscape.